Specialty optical fiber is modified, usually by doping, for a specialized function. It consists of one or more transparent fibers enclosed in a protective covering. Optical fiber should not be confused with fiber optic cables. Optical fiber is a component that goes into the making of fiber optic cable. The core and cladding are typically grouped together and collectively called the optical fiber. Specialty optical fibers have various characteristics that suit a specialized application. Optical fibers are dielectric wave-guides that transport optical energy and information. As shown in the image above, they are circular and have a central core surrounded by a concentric cladding with a slightly lower refractive index. The fiber is thin, typically less than 0.1mm in diameter. The core of the fiber can be made out of plastic, such as polystyrene or polymethylmethacrylate, or glass such as silica. The cladding is typically made out of Teflon or silica with a small amount of dopants such as boron or germanium to change the index. There are advantages and disadvantages to both plastic and glass. Plastic core fibers are more flexible and inexpensive; however they transmit light less efficiently leading to high losses. Plastic is best used for short distances, such as within a building. Glass core fibers are much more common because they are capable of transmitting light effectively over large distances. Light traveling through the fiber bounces off the cladding at shallow angles and stays completely within the fiber. This happens when the light hits the interface at an angle larger than the critical angle. At this angle it will not pass through to the second medium at all. This phenomenon is known as total internal reflection. The critical angle can be calculated using Snell's law, putting in an angle of 90° for the angle of the refracted ray. If the angle of incidence is larger than the critical angle, Snell's law cannot be solved for the angle of refraction, because it will show that the refracted angle has a sine larger than 1, which is not possible. Video explaining total internal reflection and how the signals are translated. Optical fibers are designed so that the core has a higher index of refraction than the cladding. This means that light will be confined to the core if the angular condition for total internal reflectance is met. Specialty optical fibers can fit into two broad classifications of modes. The geometry and composition of the fiber determine these modes, also known as discrete electromagnetic fields. Radiation mode - Radiation modes carry energy out of the core. This energy is quickly dissipated. Guided mode - Guided modes confine the energy to the core. The energy is propagated along the fiber and transports the information or power. Light in the fiber can be described as a combination of the modes. The degree to which the mode is excited is determined by the conditions of the launch, such as input cone angle, sport size, axial centration, etc. Information, such as analog voice signals, is translated into digital signals. The digital information is then sent bit-by-bit (1's and 0's) by a laser; modern lasers can send the information at rates of billions of bits per second. Today's system uses different colored lasers to fit multiple signals into the same fiber. This information can be carried over long distances (60 miles) with equipment huts every 40 to 60 miles; these huts retransmit the signal down the next segment at full strength. Both single mode and multimode specialty optical fiber is available. Single mode fiber has a core diameter that is only a few times the wavelength of the light transmitted. By contrast, multimode fiber has a core diameter that is much larger than the wavelength of light transmitted. This larger diameter allows many modes to propagate. Typically, single mode fibers are used with laser sources for high speed, long distance links. Multimode fiber is commonly used with light emitting diode (LED) sources for lower speed, shorter distance links. For more information on fiber types, read How to Select Fiber Optic Cable. Selecting specialty optical fiber requires an analysis of performance specifications such as wavelength, numerical aperture, maximum attenuation, bending radius, and operating temperature. Wavelength for which specialty optical fiber is designed is measured in nanometers (nm). Maximum attenuation is the decrease in signal strength along a fiber optic waveguide caused by absorption and scattering. It is the single most important specification in determining the cost of fiber optic telecommunications. It is used to determine spacing of repeaters needed to maintain acceptable signal levels. Attenuation is usually expressed in dB/km. Intermodal dispersion- A phenomenon between different modes in an optical fiber. This only applies to multimode fibers since as the pulses travel down the fiber they spread into one another. The bandwidth and distance are limited. Intramodal dispersion- Intramodal dispersion is the result of the material properties of the optical fiber and applies to both singlemode and multimode fibers. Intramodal dispersion can be further broken down to chromatic dispersion and polarization-mode dispersion. Chromatic dispersion is the principle that different wavelengths will travel down an optical fiber at different velocities. Polarization dispersion is caused by imperfections in the core. Since the core is not perfectly circular, mechanical stresses introduce birefringency in the fibers which causes one of the orthogonal polarization-modes to travel faster than the other. This causes a dispersion of the optical pulse. Bending radius is the smallest radius that an optical fiber or fiber cable can bend before increased attenuation or breakage occurs. Operating temperature is the full required range of ambient operating temperature. 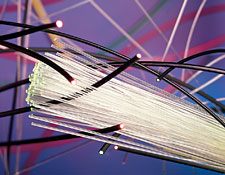 Optical fibers play a critical role in many industries, particularly in telecommunications. They are replacing copper metal wire due to their many advantages. Optical fibers are thinner than metal wire, lightweight, and non-flammable because no electricity is passed through them. The fibers are flexible and can be used in digital cameras for medical, mechanical, and investigative imaging. Optical fibers can perform with low power, and have a higher carrying capacity than metal wires. Since optical fibers use light signals there is less signal degradation and the fibers can carry digital signals. Attenuating fibers are used at the ends of optical fiber links to adjust the transmitted signal down to a controlled degree of attenuation, or to provide reflection-free termination. To achieve this, a short piece of ATN is used in the attenuator. Optical fibers are doped with both erbium and ytterbium. High NA fibers capture more input with very low, bend-induced attenuation. Fibers are coated with metals for increased temperature resistance, ease of soldering, and suitability for harsh environments. Image credit: Thin-films Research. Inc.
Mid-IR fiber is designed to provide ultra-low loss optical transmission in the mid-infrared spectrum (2 to 10 microns). Photosensitive fibers exhibit uniform and controlled photosensitivity to conventional UV radiation techniques. The quality of the Bragg grating depends heavily on the UV-sensitive fiber used to write the grating. Optical fiber is doped with ytterbium. Fiber optic cables are composed of one or more transparent optical fibers enclosed in protective coverings and strength members. Fiber optic cables are used to transmit "light" data.